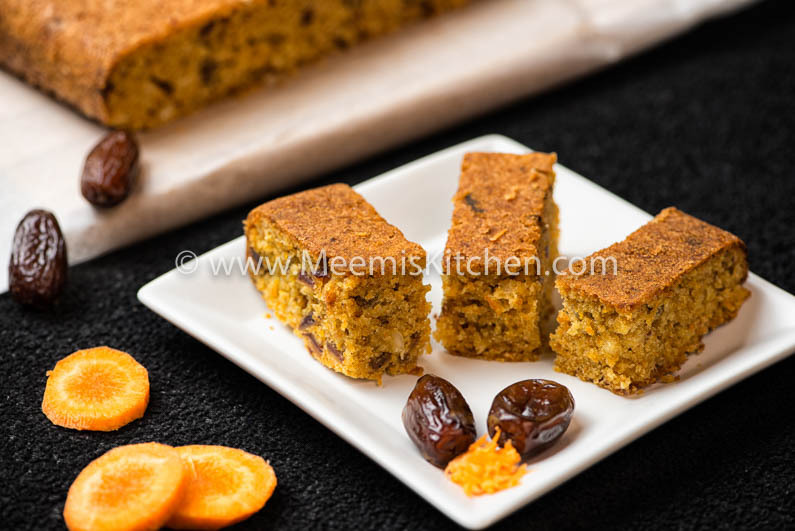 Dates and Carrot cake is a super nutritious cake with the goodness of carrots, dates and nuts. It’s a great munch nibbles idea for kid’s snacks boxes, as they are packed with rich fruits and veggies. Carrots are healthy, as they have a high content of carotene and other vitamins along with fiber. The dates, as you all know, is a storehouse of minerals like Potassium and Manganese. Thus, you can be assured that this cake will curb your sweet tooth cravings with just enough sugar, while providing you with added nutritive supplements..Another carrot cake you might like is Apple Carrot cake. This is a very simple recipe for a delicious, moist Dates and Carrot cake. The grated carrot, dates and nuts complement each other perfectly to give you this rich cake brimming with delightful flavors and grainy texture. It is very simple to make and a great tea time snack like Marble cake, Vanilla Sponge Cake, Chocolate Orange cake or chocolate strawberry cake. This “Dates and carrot cake” doesn’t even need frosting/ icing to taste fantastic, but you can add some whipping cream or ice cream while serving, to delight your guests. It can be prepared for special occasions or celebrations like my Carrot cake with cream cheese frosting, Black Forest Cake, Dates and Banana Cake, Pineapple Swiss roll or Christmas fruit cake. Also try pairing with Homemade Dates Wine, another wonderful recipe with the “Bread of the Dessert”. With just a hint of Cinnamon and nutmeg, the fusion of flavors just melt your reserves and leaves you yearning for more. Let me warn you, you won’t be able to stop at one slice. Well, it is really okay to indulge in sweet nibbles once in a while! I really enjoy Dates and Carrot cake and… I don’t feel guilty. So, go ahead and enjoy your nutritious treat!! It is SOOOO GOOOD!! Clean, peel and grate carrots (1 ½ cups) and keep aside. Take out the seeds and chop the dates (1 cup) finely. Chop the walnuts and Cashew nuts (1/2 cup). Grease a baking tin with butter and dust it with flour. Measure all the ingredients. Sift the flour (200 gms), Baking Powder and Cinnamon/nutmeg powder together three or four times to mix it well. 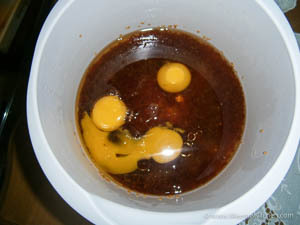 Beat the vegetable oil, demerara sugar and 3 eggs in a mixing bowl till well combined. 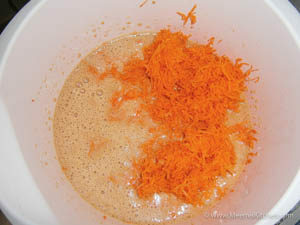 Add the grated carrot and mix well. Now mix in the essence. 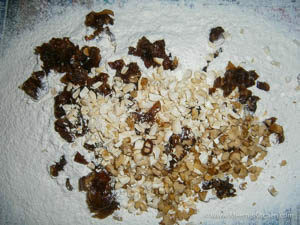 Add the chopped dates and nuts to the sifted flour and mix well. Slowly mix this flour to the batter and mix well. Transfer this batter to the greased cake tray. Fill the cake pans only half. Pre heat the oven to 180oC (356oF) and lightly tap the tray on the counter before placing them into the oven. Bake in the preheated oven for 35-45 minutes or till done. The baking time will vary according to the size and shape of the pan. Keep watch after 30 minutes and take out and insert a toothpick in the middle and if it comes out clean, your cake is perfect. Allow it to cool in the same pan and invert to a cake board/ plate tapping at the bottom of the pan gently. You can try decorating by sprinkling icing sugar on top/ serve plain/ top it with whipping cream or ice cream. Enjoy the flavors!! Always make sure you have the correct measurements. (It is better to have weighing scales or cake measuring cups, to get exact measures). Use odorless vegetable oil only (I used Sun drop brand Sunflower oil). You can substitute oil with melted butter. Fresh eggs should be used for a better result. Tapping the pans will force any air bubbles to the surface, which can help avoid holes in your finished cake. 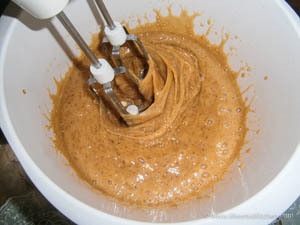 Flour, baking powder and Cinnamon/nutmeg powder should be mixed well. Sift 3 -4 times to release air bubbles. This cake is to be baked at 180o c.
Hope you liked this simple Dates and Carrot cake. Continue to encourage me by commenting below or by sharing to your friends using the links on the side. God Bless!! Hi Suchitra, Thanks for trying. Hope you have taken the correct measurements. The flour should be folded in and not beaten. The batter should not be tight, it should be thick but smooth. Try adding an extra tbsp of oil to loosen up next time. And cover the pan with aluminium foil to retain moisture. This should help. Let me know after trying! Happy baking!